Since the 1970's Christ Church has hosted the Community Soup Kitchen, making available the use of the kitchen and dining hall of our parish house five days a week. A non-sectarian charity with an independent Board, the Community Soup Kitchen is the largest organization of its kind in New Haven. It provides a vital service to New Haven's neediest citizens, as well as an opportunity for parishioners, local residents, and college students to serve the poor. More information can be found on their website, www.csknewhaven.org. What iS Saint Hilda's house? Saint Hilda’s House is a partnership among Christ Church, Berkeley Divinity School, and the Episcopal Church in Connecticut, which is designed to allow young adults to turn their Christian faith into action, both by living in community and serving in the city of New Haven. The Hildans live adjacent to Christ Church, situated in the heart of the city, and serve in a diverse range of worksites to meet many of the specific needs found in New Haven. 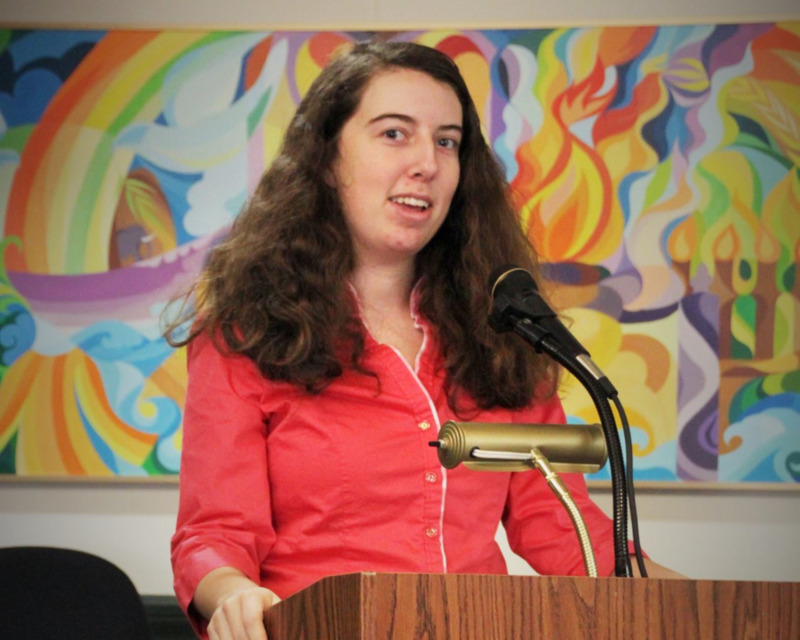 Megan McDermott ('14-'15) speaking about food justice. New Haven carries all the challenges and the benefits that come with that. Hildans work anywhere between 30-35 hours per week, hours that are as rewarding as they are demanding. Each worksite is different, and as a Hildan every effort will be made to ensure that you find yourself in the place which best allows you to live out Christ’s call of love and service. At the heart of the philosophy behind St Hilda’s House is the belief that individuals best flourish as part of a community. Hildans therefore live together in intentional community, with a stated commitment to be mindful, loving, and supportive towards each other. Though the nature of each individual community is determined by its members, an evolving structure is also in place to give Hildans the space to best decide how living in community will look for them. As well as a serving community, St Hilda’s House is also a worshipping community, both being thought essential to a Christian life. Worship takes many forms, many of which must be developed by individuals and communities in the context of their own lives, and Hildans are encouraged to give real thought to how they can best practice worship. As well as this, Hildans commit to take an active role in the worship and prayer life of Christ Church. Heidi Thorsen ('13-'14) and David Burman ('12-'14) speaking with the Presiding Bishop of the Episcopal Church from 2006-2015, the Most Rev. Katharine Jefferts Schori. St Hilda’s is not a stop off point where you can spend a year waiting for the pattern of your life to reveal itself. Throughout the year Hildans are challenged to begin to discern their call through discussion, action, and reflection, so that they can grow into it as the year goes on and end with a clearer sense of where God wishes them to wander next. For more information, please visit our website, www.sainthildashouse.org. Jerusalem Peacebuilders (JPB) is an interfaith, non-profit organization whose mission is to create a better future for humanity across religions, cultures, and nationalities. Integral to that mission is the belief that the future of Jerusalem is the future of the world. To that end, JPB promotes transformational, person-to-person encounters among the peoples of Jerusalem, the United States, and the Holy Land. Christ Church is a proud partner of JPB. JPB’s interfaith programs focus on uniting Israelis, Palestinians, and Americans and providing them with the opportunities, relationships, and skills they need to become future leaders for peace in the global community. A passion for peace drives our mission and partnerships power our program. Jerusalem Peacebuilders now oversees three youth leadership programs of successive levels in New Haven, CT, Houston, TX, and Brattleboro, VT. Each camp runs over the course of two weeks and provides the individual campers with leadership skills, personal dialogues, guest speakers, and a faith-based component. We take frequent field trips and provide outdoor recreational activities including horseback riding, swimming, and canoeing. We enjoy delicious home cooked meals prepared by our camp volunteers. The success of our program relies on the family atmosphere, the carefully selected small group, and the emphasis on religion and faith. Participants become immersed in the themes of the program and begin to embark upon a journey of transformation they will never forget. Participants in the JPB program are an extraordinary group of young, carefully selected people. Their commitment to bringing peace to their communities is so strong that they have been actively engaged in the program for at least one year before attending one of JPB's summer programs. This dedication is evident in their avid desire to acquire the tools that will allow them to shine as leaders in forging a peaceful society in Jerusalem and across the Middle East. For more information, please visit JPB's own website.